New and Improved Survivor's Handbook! 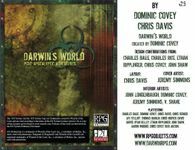 The premier d20/OGL post-apocalyptic roleplaying game, Darwin's World 2nd Edition, is back in print. The same great rules, but now in a more useful format! The Survivor's Handbook contains all the player rules plus the relevant rules from the Modern System Reference Document, as well as expanded material previously available only in PDF. Darwin's World 2nd Edition is focused on separating the mechanics from the setting, making Darwin's World the definitive guide to building post-apocalyptic campaigns, whether you are playing in the Twisted Earth or your own preferred post-Fall setting. Electonic product comes with both a landscape PDF for ease of viewing on a computer monitor as well as a standard layout PDF for printing.